I’ve fallen in love with a product. Here it is. I buy it at Whole Foods in Tulsa, Oklahoma, and just now when I looked up their website, I realized that the company is in Oklahoma! We have a lot of pecans here. Yes, I know. 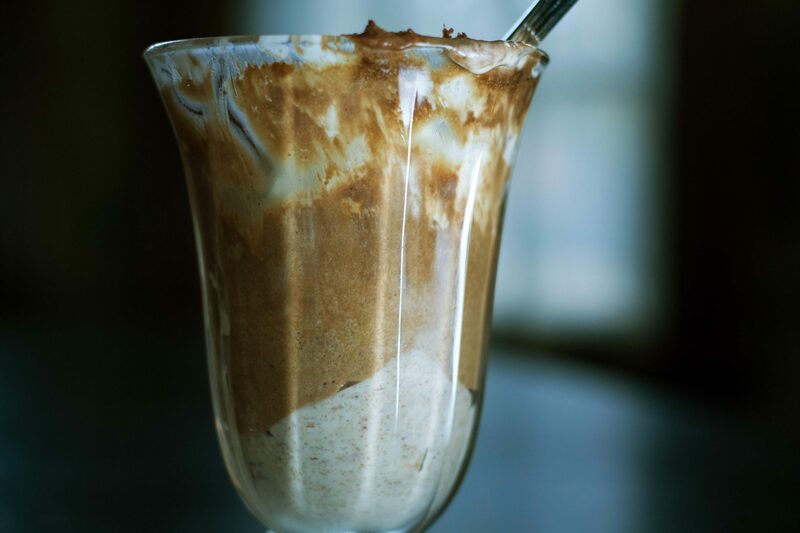 I finally have a Vitamix and I could so easily make this myself. It’s pecan butter, just like a peanut butter, but made from toasted pecans, and sweetened a little. 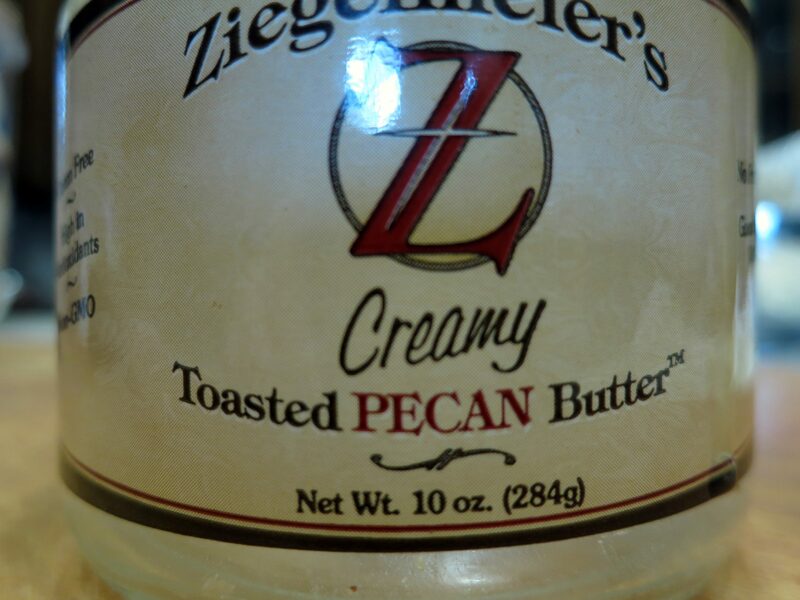 But instead of just spreading it on apples and overindulging, because it’s that good, (there’s a chunky version that is heavenly) I decided to use this stuff in a dessert, so I could really enjoy it. I was having friends over for a pre-Thanksgiving dinner, and I had a disaster of sorts with the pumpkin roulade I’d planned on serving. Let’s face it – things don’t always work out in the kitchen. 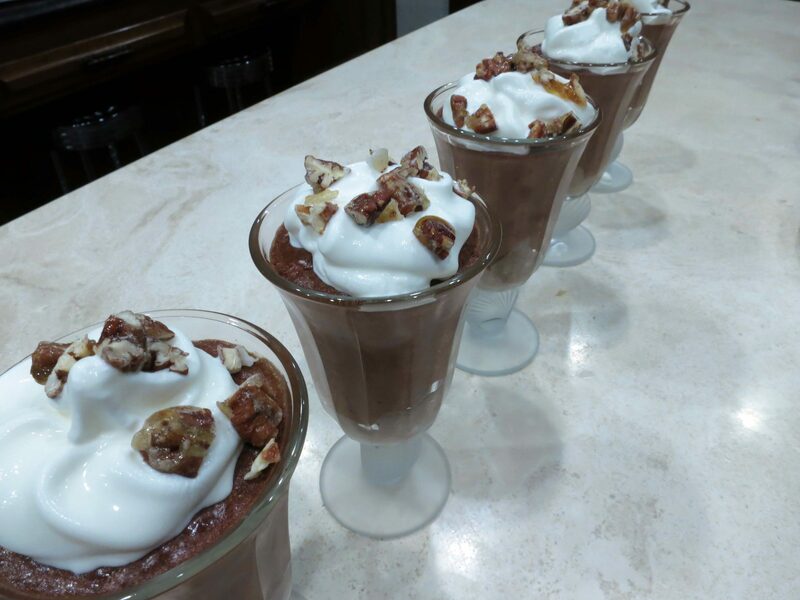 So that morning I ran to the grocery store to get some last-minute produce, and bought chocolate to make a, wait for it… chocolate pecan mousse! I had a good 7 hours of chill time in the refrigerator before I served dessert, so I was pretty sure this would fit the bill. A bit of chocolate and pecan indulgence, but not too much. 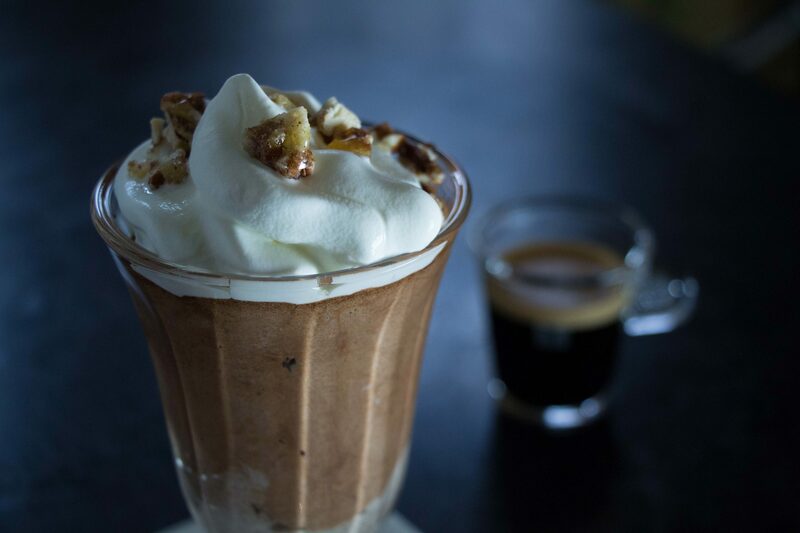 Topped with whipped cream and candied pecans. Oh, and layered with a creamy pecan butter! So I set to work but then got a phone call from my daughter. I hadn’t even gotten the chocolate melted yet, but I don’t get to talk to my busy daughter that often. Oh, and I should point out that phones don’t work in my kitchen, which is why I just had to run in, turn off the heat, and run out. But after about 30 minutes I told her that I really needed to go. Then, I got a call from a friend, and we gossiped chatted for quite a while. 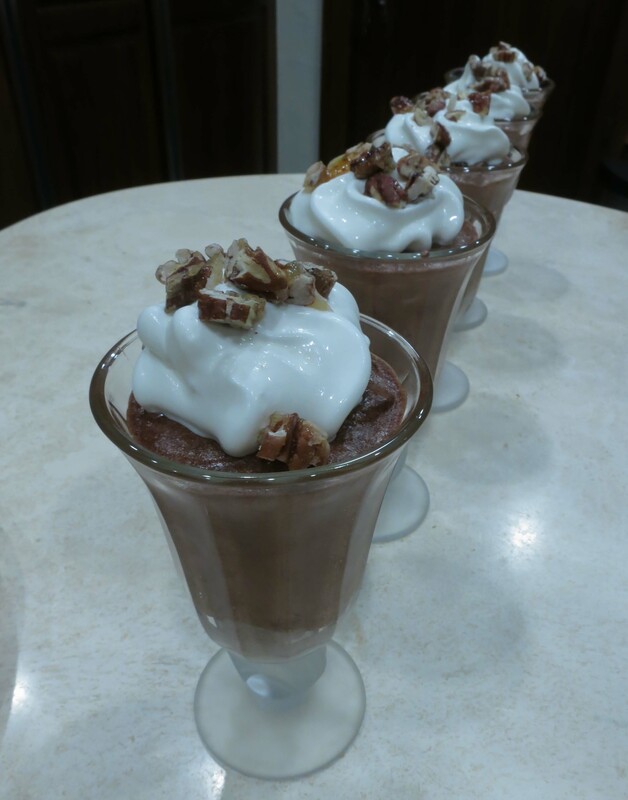 I have to say that I was getting a little nervous, because I usually make chocolate mousse the day before I plan on serving it! Firstly, separate the eggs. 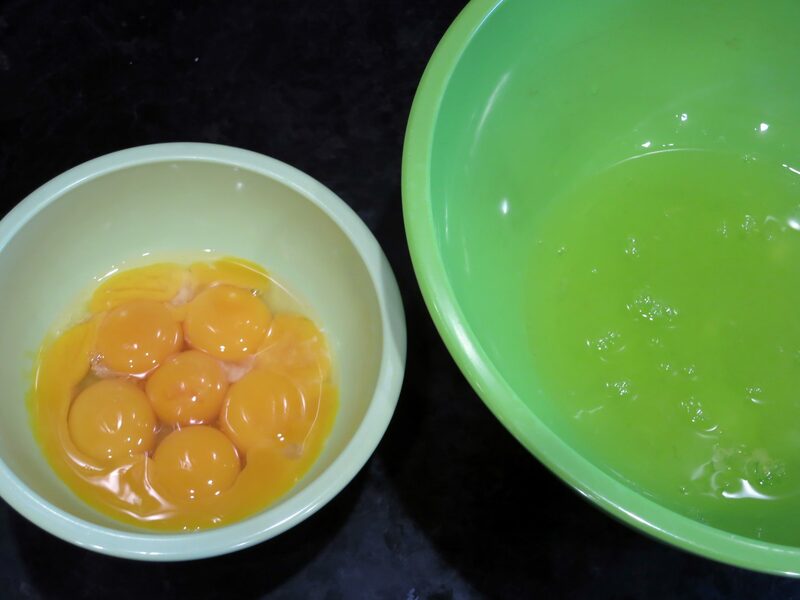 Place the yolks in a small bowl, and the whites in a larger bowl. 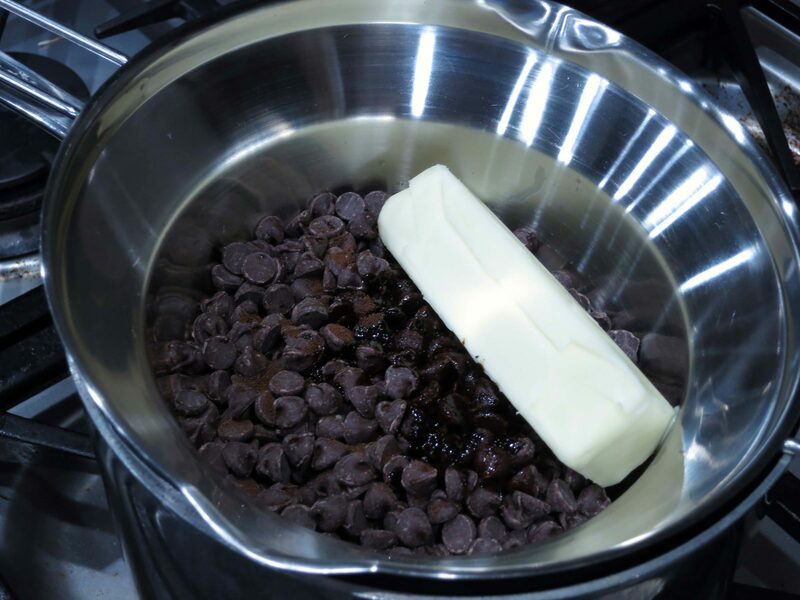 Place the chocolate, butter, sugar, espresso powder and cognac in a pot that is over a pan filled halfway with water over medium heat. This is also called a “double boiler” system. 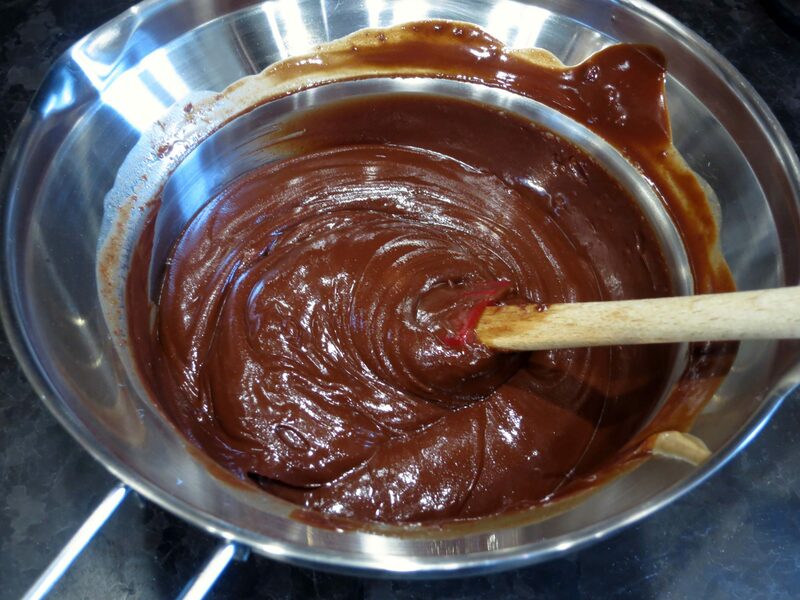 This is tempering, or melting the chocolate. Often chocolate is tempered by itself, and one drop of water or anything can seize up the chocolate and you have to start over. However, if there’s a significant amount of other ingredients, like the butter, in the pot, it will work perfectly. Pour the oil from the pecan oil into a small bowl and save it. I actually used it on the roasted Brussels sprouts I made that evening, plus a little bit of pomegranate molasses. They didn’t taste pecan-y, but they were mighty good. Save the oil. Oh, and I tasted it because I didn’t want a sweet oil on the Brussels sprouts, but the oil itself that had separated from the pecan butter wasn’t sweet at all. Now, back to the recipe. 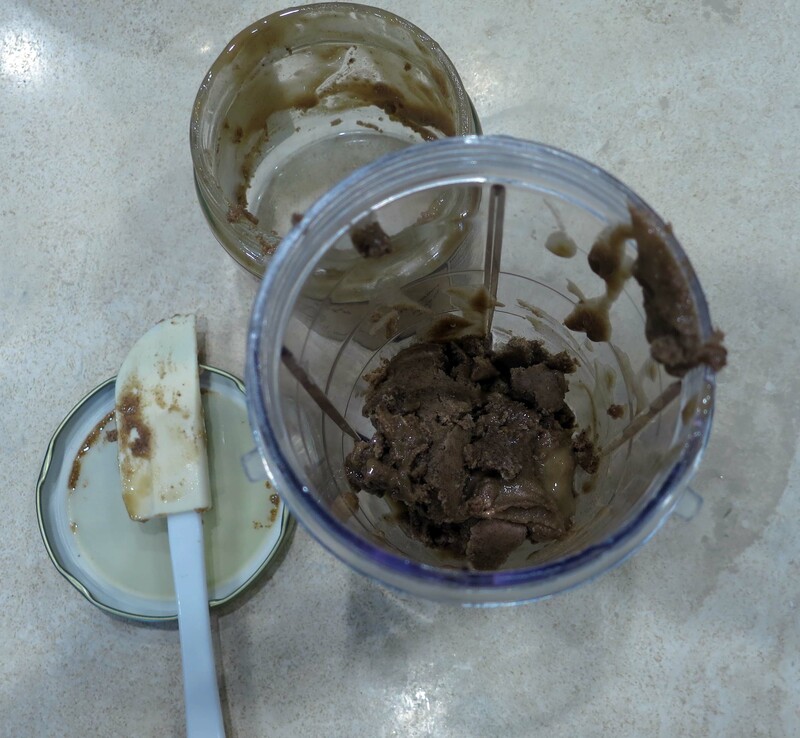 Add about half of the jar – a little over 1/2 cup – of the pecan butter to the chocolate-butter mixture. 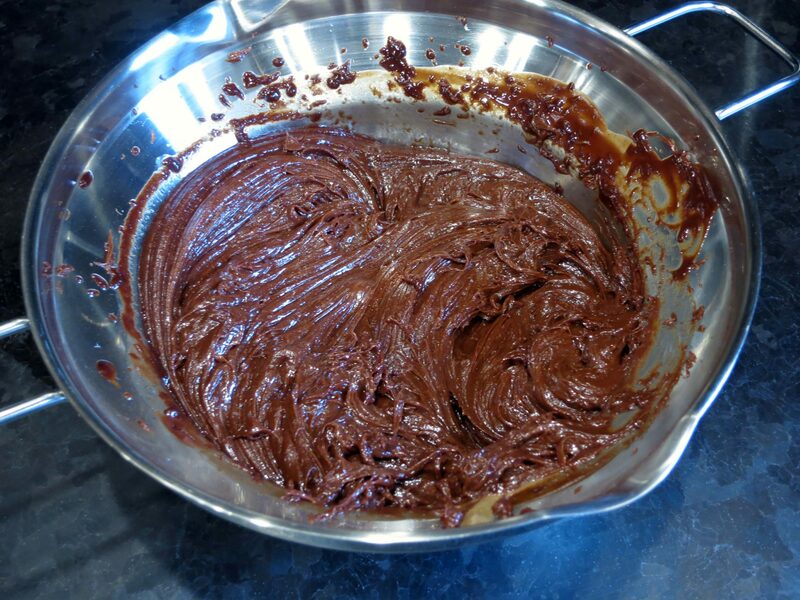 Gradually, using a spatula, stir the ingredients together until the chocolate and butter are completely melted. Remove the pot from over the hot water and let it cool for about 10 minutes. Meanwhile, place the remaining amount of pecan butter into a mini blender. Add cream and blend until it’s almost pourable, and set aside. 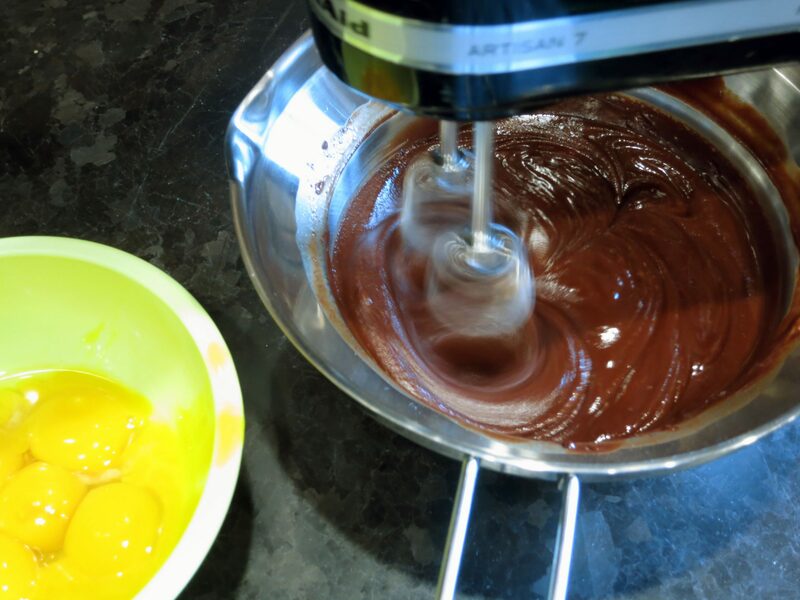 Using an electric mixer on medium speed, begin adding one egg yolk at a time to the chocolate mixture, and beat it in well. 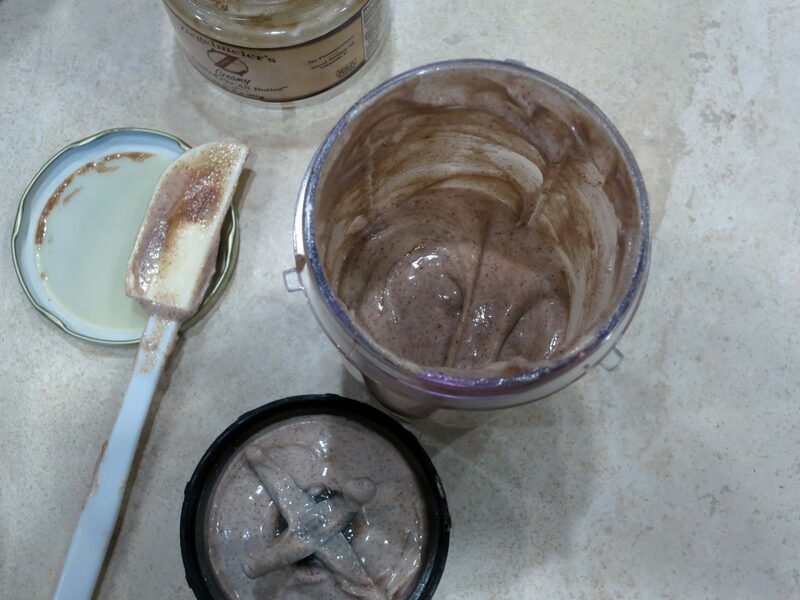 The chocolate mixture starts out like this. And after all of the eggs are beaten in, it becomes thicker, very shiny and smooth. Because of the inclusion of the pecan butter, the chocolate-pecan mixture felt very differently than the traditional chocolate mixture does without pecan butter in it. I could tell it was much stiffer and would be more challenging to work with. But I kept going. Chin up. Using clean beaters, beat the egg whites until they are stiff. 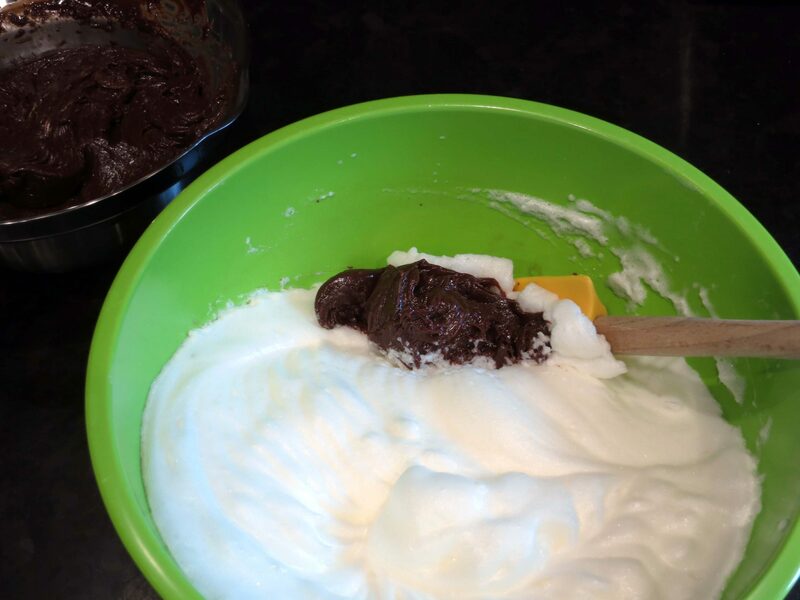 Then, begin folding in the chocolate into the egg whites. Be patient, because it will, eventually work. I decided to quit folding and folding and just deal with some chocolate streaks within the egg white mixture – I didn’t want to deflate the mousse. My friends don’t care. 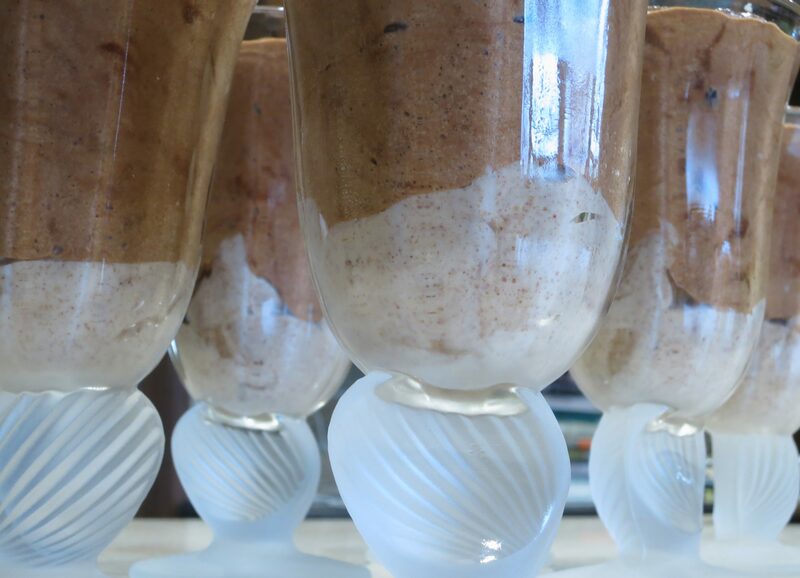 First place some of the creamy pecan butter in the bottom of parfait glasses. Then top that with the mousse. 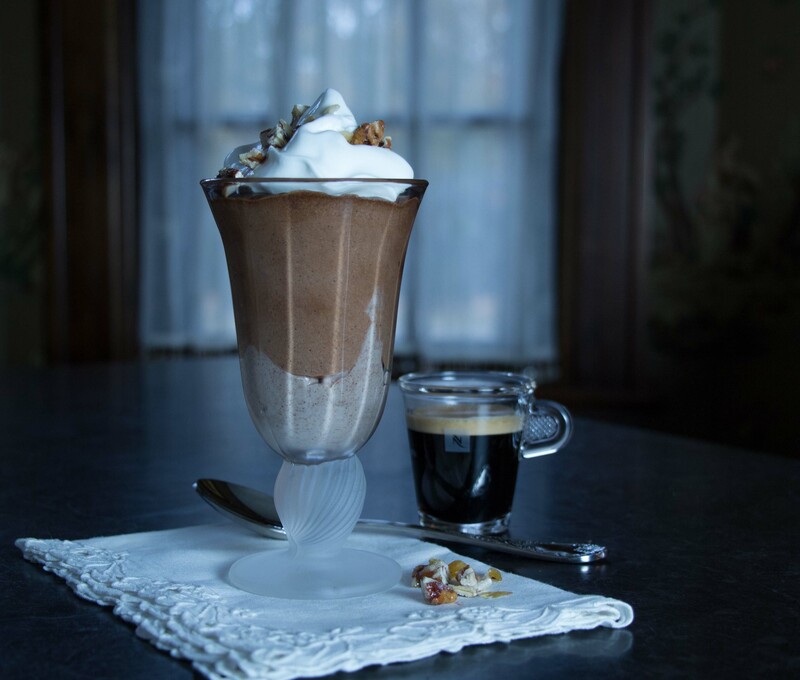 Refrigerate the parfait glasses immediately. If they would have been refrigerated overnight, I would have covered them with plastic wrap; I’ve always read that chocolate can pick up flavors from the refrigerator. 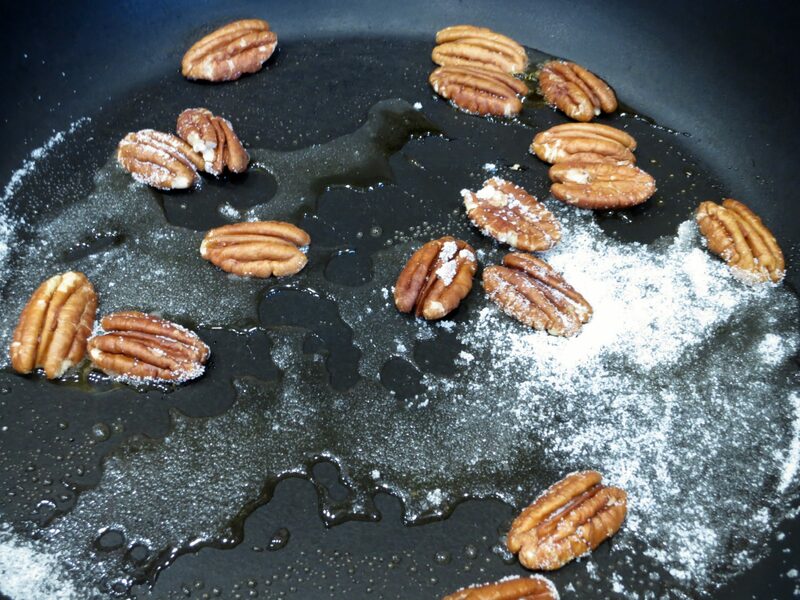 To make the candied pecans, place some pecans in a skillet over medium heat. Sprinkle with white sugar. Eventually the sugar will melt. Don’t do what I did and completely forget that I’d just done this. I was playing on my ipad in another room when I started smelling burning pecans. The whole kitchen was full of smoke. Fortunately the smoke alarm didn’t go off, but it took about a half an hour to get the smoke out, clean the skillet, and start over. So this is the sugar melting slightly. 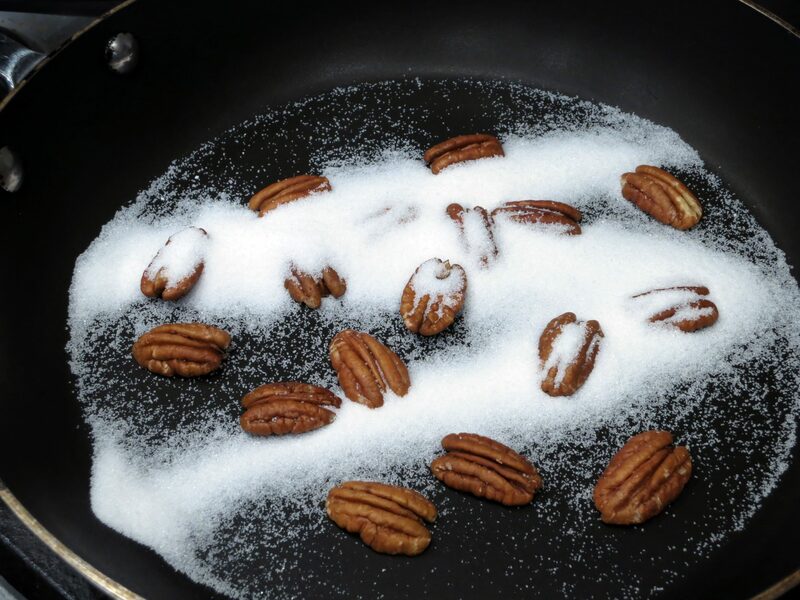 Use a spatula to move the pecans around and try to get them coated with what is essentially caramel – melted and caramelized sugar. 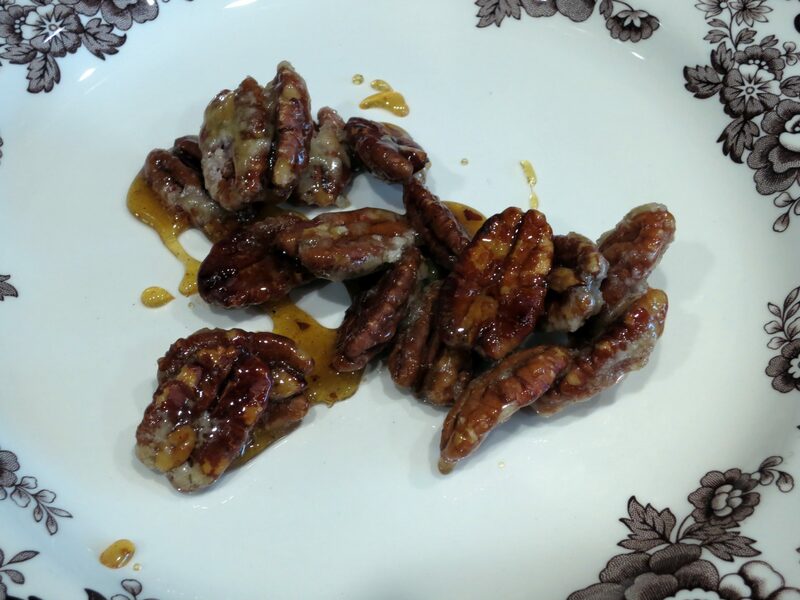 When you’re happy with the color of the melted sugar, place the candied pecans on a plate to cool. 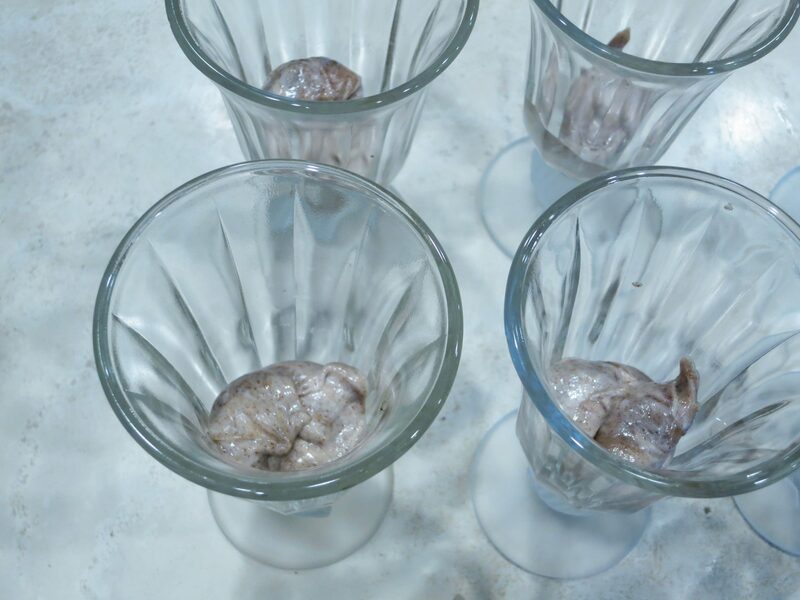 Before serving, remove the parfait glasses from the refrigerator. You can do this up to an hour before if you like, but I like my chocolate mousse chilled. It’s your choice. 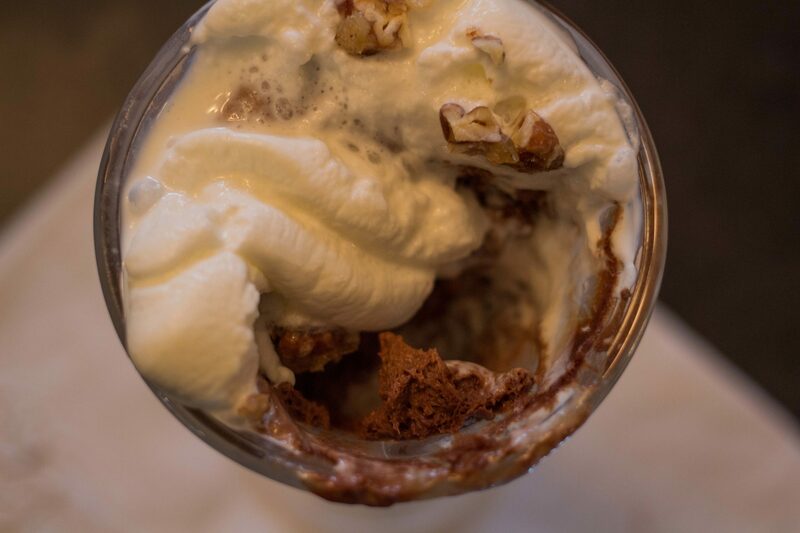 Whip the cream and place a dollop on top each parfait glass. 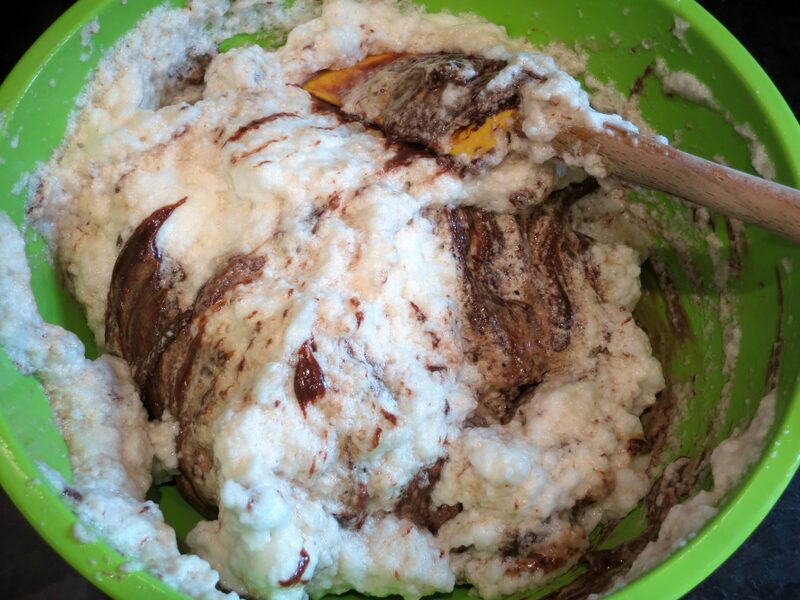 Chop the candied pecans coarsely and sprinkle them over the whipped cream. I’m sure there’s a more sophisticated way of “plating” this dessert, but plating is not my specialty. Again, my friends don’t care about such things! I was actually too full to have dessert that night, after all of the cheeses and other goodies I’d set out for hors d’oeuvres, so I enjoyed my mousse the next morning with an espresso. Don’t judge me. Desserts are fabulous for breakfast. As long as you can get past the heart beating extra fast for an hour or so. verdict: This mousse is even better than chocolate mousse. And chocolate mousse is heavenly. You can taste the toasted pecan flavor in the mousse itself, but having that layer of the bottom of creamy pecan butter really added to this dessert. A pretty tasty invention if I might say so!